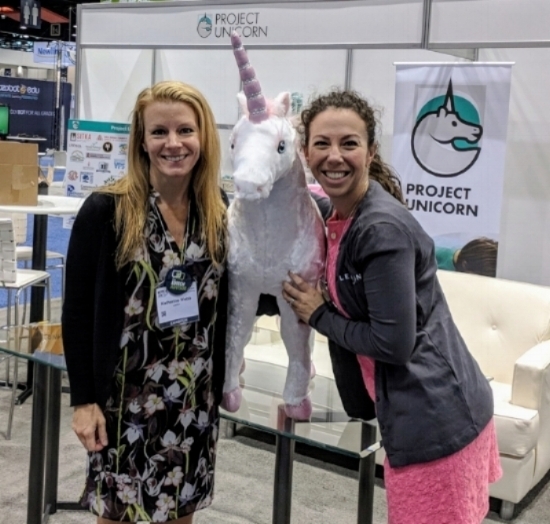 ISTE 2018 has somehow come and gone, and it was one for the books, with the largest attendance on record (and the best use of an inflatable magical creature, thanks to Project Unicorn). There was electricity in the air from the second you stepped foot in the exhibition hall. Tens of thousands of educators roamed the aisles, interacting with each other and meeting with product providers to check out the latest innovations in edtech (not to mention participating in some of the best karaoke you’ll find anywhere). Organizations across the floor shared major announcements and ISTE itself revealed the releases of several exciting new benefits for its members, including ISTE U (an online learning hub for educators) and Edtech Advisor (an edtech rating and review tool, powered by LearnPlatform). The Lea(R)n team was out in full force, meeting with educators to discuss new ways to organize, streamline and analyze their edtech tools, as well as reconnecting with peers who have continued to act as incredible champions of applying data to edtech decisions that increase equitable access and drive student outcomes. There were so many amazing moments and memories from ISTE 2018,, we’ve asked members of the Lea(R)n team to share their experience — What stood out? What new innovations did you see or edtech discoveries did you make? What was a compelling takeaway or inspiring story you brought home with you? The ISTE community is one of trust, commitment and excitement. For decades, ISTE has nurtured and supported a shared commitment to the value technology can bring to the teaching and learning. The frenzy when so many ISTE members join together and share is infectious, exciting and truly hope-building. Since my teaching days, ISTE has been a big part of why I love the education technology field. My first ISTE conference was in 2005 and back then was known as the National Educational Computing Conference (NECC). I was immediately taken by the enthusiasm, eagerness and love of learning so apparent in each session I attended and everyone I met in Philadelphia that year. Since that time, I have attended the big conference and ISTE-affiliate events like NCTIES as a teacher, an edtech director and with our team at Lea(R)n.
This year’s ISTE conference was a special one for me. As a member organization dedicated to harnessing the power of technology to transform teaching and learning, accelerate innovation and solve tough problems in education, our partnership with ISTE meant that I was able to connect with ISTE members to share the news of Edtech Advisor. I was able to support our partners like Blair Mishleau, who led not one, but two People’s Choice sessions! And my favorite thing about conferences (especially ISTE) is the conversations — a time to talk about work being done to ensure equity of access to the right kind of technology, data to enable smarter decision-making and the understanding that we’re all working together for these common goals. Most compelling to me this year was that rather than talk about why data is important, the focus is on how to harness it to make contextual and appropriate decisions for unique organizations like school districts and member networks. No longer a one-size-fits-all approach, my most memorable conversations at this year’s ISTE involved decision-makers on the ground who are engaged with data and looking to make the most out of their edtech decisions. Thank you for another wonderful year, and here’s to the future! My big takeaway is that district administrators are rethinking how they look at product providers — not as tools to be purchased, but as partners to help do the work of increasing opportunities for all students. Leaders like Caity Stockstell (@iStockTeach ), Brandie Wright, Sarah Hanawald (@sarahhanawald ), Michael Cardona (@mcardona1989), Michael Arensdorff (@marensdorff25), Jim Farmer (@JFarm) and so many others are making concerted efforts to practice continuous improvement in providing the right learning technologies for teachers and students. The proliferation and challenges of data and digital learning tools werewas increasingly a topics of conversation with everyone who stopped by the booth to connect. A couple of years ago, it seemed administrators and educators were figuring out the best way to supplement teaching practices with digital tools and how to manage and balance classroom needs with preparing students for successful lives - but edtech felt like an addition, and thinking about edtech management and measurement seemed aspirational. There were questions around “what” edtech impact would be, on instructional practice, budget and student outcomes. At this ISTE, conversations centered on “how” digital learning is impacting those aspects of learning organization management and figuring out actionable pathways to determine what tools are being used, understand how to engage educators in edtech selection and review processes and measuring the impact of those tools - then organize and scale all of that. It’s awesome to have discussions with edtech heroes, champions and pioneers that feel much more like how to get all of this done, to drive outcomes and increase equitable access for kids, than whether or not it can be done. Partnering with people doing the work day in and day out, providing resources and celebrating the wins is so rewarding - and ISTE gives us the opportunity to hear about this work and high five the hands making it happen. Something that struck me were the continued calls for merit over marketing, and the need for schools and districts to make evidence-based, data-driven decisions through practical, actionable research. Themes continue to emerge around bridging the gap between research and practice. This can be accomplished through research-practice partnerships and through systems (e.g., LearnPlatform) and tools (e.g., IMPACT) that build the capacity within schools and districts to collect rigorous yet practical evidence on their educational interventions. It’s clear the market is getting more demanding. Schools and districts are starting to realize that it’s actually possible to measure the usage and impact of tools they’re using in their classrooms. Further, they are starting to understand how organizing, streamlining, and analyzing their edtech portfolio informs important instructional, operational, and budgetary decisions. Organizations are realizing how they can work together to improve equity and student outcomes. For example, scaling personalized learning can be accomplished through collaborations among complementary frameworks and measurement tools from organizations like Highlander, the Learning Accelerator, Digital Promise, LEAP, and Lea(R)n.
This was my first time attending ISTE (and going to Chicago!) and the energy was high! Everyone (attendees and exhibitors) had a goal to learn or teach, and all agreed that they wanted to do better in the education field. What was great for us this year was partnering with ISTE on the EdTech Advisor. As members of ISTE, educators get access to the product library to rate and review edtech tools and apps based on their experience using these tools in their classrooms. So even though we didn’t get to speak to all of the 24,000 attendees, they have access to this awesome platform powered by us! As far as the team - well, I got pretty lucky working with an amazing group of people who believe in the impactful work we do! Product providers had great interest in IMPACT-Ready, a self-certification for their meeting key compliance standards including student data privacy, accessibility, and data interoperability. Companies recognize the opportunity to be ever more transparent and how a one-stop badge can simplify and expedite their school customer discovery and procurement processes. Lea(R)n was also excited to be invited to lead a workshop at the Project Unicorn bootcamp to share our experiences around data interoperability. Our Chief Product Officer Wes Burt and myself led a discussion about how both product providers and schools can benefit from data interoperability, as well as how best they can navigate the pathway forward. Wes emphasized the importance of product usage data interoperability for LearnPlatform to best serve its customers and partners in evaluating the impact of technologies on student performance. ISTE 2018 was a wonderful experience. We met so many innovative creators and educators and had the opportunity to share our story with many of them. Fortunately, even if you weren't able to attend the conference, many of the edtech tools featured at ISTE can be found in the LearnPlatform product library, which offers reviews and insights for more than 5,000 digital learning resources. Click here to sign up.